Not my natural go-to, but something I'm trying to explore. Why not? It's makeup. It washes off. The exciting part is that you can unlock pieces of yourself along the way that you didn't know were in there or existed. I've been pinning a lot of makeup lately on Pinterest that has pops of color. After reviewing my pins, I realized there was a common denominator, so I decided I better explore these looks for myself. On top of that, what I've received from brands lately have all been with interesting color products for the eyes. Bright eyeliners, colored mascaras, rich glitters, all things that add a little bit more drama. I had seen a close up image of a girl with freckles, wearing bright blue eyeliner top and bottom, and also in the inner rims of her eyes. I fell in love, and had to try it for myself. It's funny when I look back on these photos, because part of me loves them, part of me doesn't recognize myself, and part of me wants to do the look again. 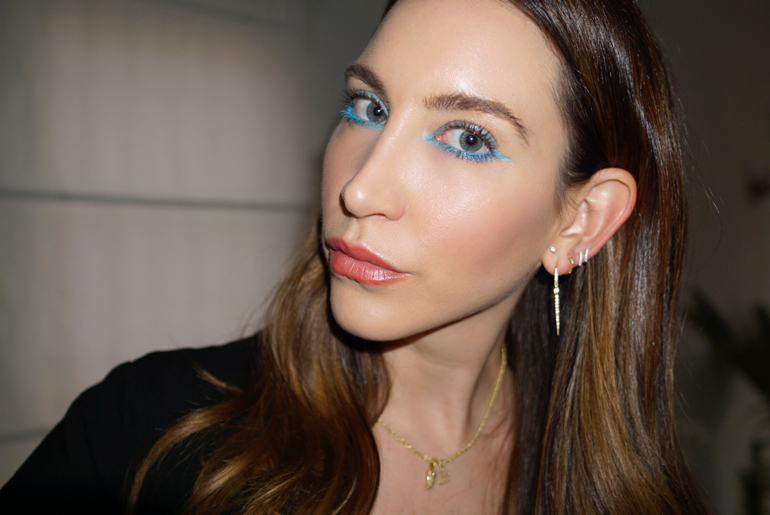 Here in this look I used a long wear gel eyeliner from Kiko, but any blue will do! Marc Beauty, L'oreal, and Lancome all have amazing blues that I've come across personally. If you notice in this video, I wanted to show you different versions of the eyeliner, so you could see different effects. You could go all the way around top and bottom, or just line the lower lash line. I like all versions, it's just a matter of style or mood. In going around top and bottom, I wanted to give myself an "Egyptian" shaped eye, like Cleopatra. I used a tiny brush to blend it in and make the shape perfect. I think it's important when playing with such bright colors to keep it easy on all the other parts of your makeup so it's not competing with the eye. I opted for clean, natural looking skin (a little glossy since I don't powder), with just an enhanced version of my natural lip color for fullness. I added a tad bit of mascara, and that was it.